Advocate staff photo by BILL FEIG -- Gov. John Bel Edwards, left, speaks to a Raise the Age rally on the state capital steps for Juvenile Justice System reform. Advocate staff photo by BILL FEIG -- Gov. John Bel Edwards, bottom center, speaks to a Raise the Age rally on the state capital steps for Juvenile Justice System reform. Advocate staff photo by BILL FEIG -- Supporters march in for a Raise the Age rally on the state capital steps for Juvenile Justice System reform. Gov. 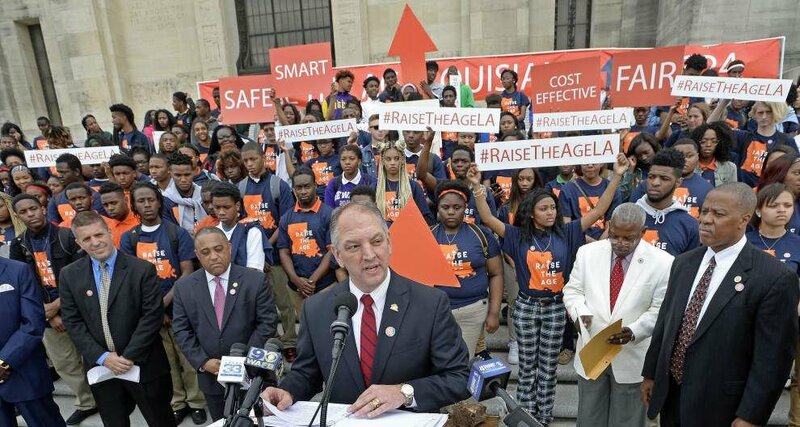 John Bel Edwards joined several hundred young people on the State Capitol steps to support legislation that would prosecute 17-year-olds as juveniles, rather than adults, for the crimes they commit. Edwards pointed out that Louisiana is one of only nine states that put teenagers in the same criminal justice system as adults. Yet 17-year-olds can’t vote, join the military or even buy a lottery ticket because they are deemed too young, he said. But if they are arrested, the teenagers are handled by law enforcement as an adult and cannot even place a phone call to their parents to tell them they are in custody. “In the eyes of the law, your 17-year-old is an adult,” he said. “It’s the right thing to do,” Edwards said. Senate Bill 324, which a Senate judiciary committee is expected to take up next week, is part of a package of bills that would dramatically change how the state’s juvenile justice system operates. 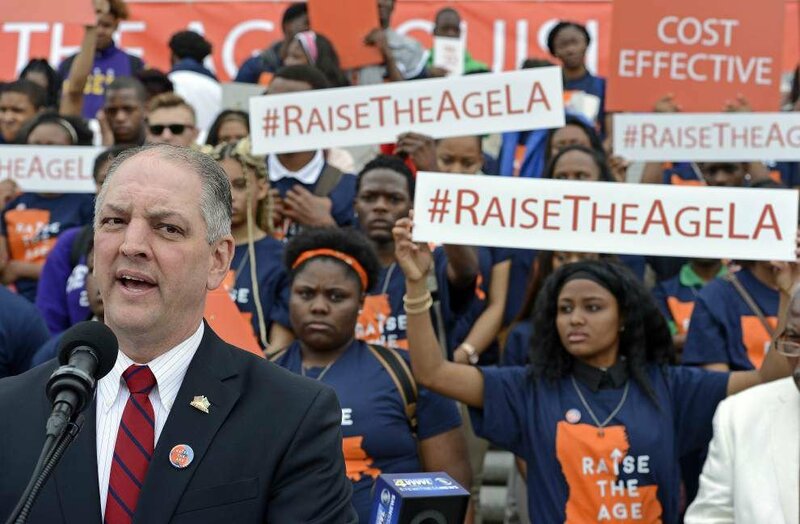 The measure, which appears on Edwards’ legislative agenda and was touted in his State of the State speech that started the legislative session, would change the legal definition of delinquent, making the age 18 instead of 17. The bill makes permissive the language in state law from requiring courts to transfer teenagers into an appropriate adult facility for detention to allowing judges to do that. New Orleans Sen. JP Morrell, a Democrat, sponsored the measure. The legislation also creates the Louisiana Juvenile Jurisdiction Planning and Implementation Council within the Governor’s Office to develop programs that would help reduce of the numbers of youth at each stage in the juvenile justice system. Only 6.7 percent of the 17-year-olds arrested in 2012 were charged with violent crimes, according the Louisiana Commission on Law Enforcement’s most recent statistics. The Governor’s Office estimates the state eventually will save about $58.3 million through lower incarceration rates, as well as security measures required to protect youth who are behind bars with adults. In addition, Rob Reardon, director of corrections at the Lafayette Parish Correctional Center, said statistics show that youthful offenders in prisons learn about crime and upon release are much more likely to return to prison as the result of committing more crimes. Shawn Kelly, who attends Loyola University in New Orleans and was an organizer of the event, said the teenagers would roam the halls of the State Capitol and talk to legislators about supporting SB324.